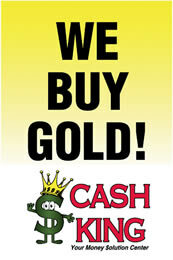 Selling your gold at Cash King is easy. Bring in any broken or unwanted jewelry and we will pay you cash on the spot for it. 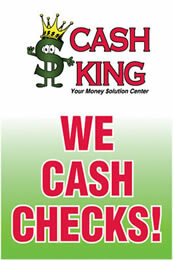 With our cash for gold services, walk out the door with money in your hand! Simply bring in your jewelry to any of our gold buying locations where our trained gold buying professionals will examine your jewelry, measure its weight, and assess its quality right on the spot. After our initial examination, we will offer you fair market value for your gold or other precious metals. You choose to accept or not. 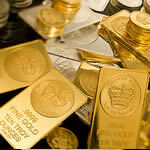 Our gold buying services offer the best rates in the State of Indiana. We invite you to call or stop into any of our gold buying locations statewide for the most current rates. The price of gold is at all-time record high! The time to sell your unwanted or broken jewelry is now! What is the current price for gold buying rates? 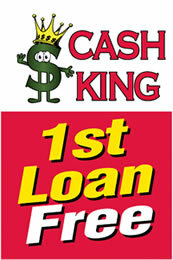 The current rates for gold buying fluctuate daily based on the market; however, at Cash King, our gold buying rates are the best in the state. Please call or stop in for the current gold buying rates. How is the final sale price calculated? The final sale amount is calculated based on the current gold rates, total weight, and karats. A trained professional will examine your jewelry and provide an accurate assessment on the spot. Do you accept any other precious metals? No, gold is the only metal we are currently buying at our locations. How soon will I receive my cash if I sold my jewelry? You will receive payment for your jewelry on the spot and will walk out the door with cash. Do you accept broken jewelry? Yes, we accept any broken jewelry, no matter the condition.